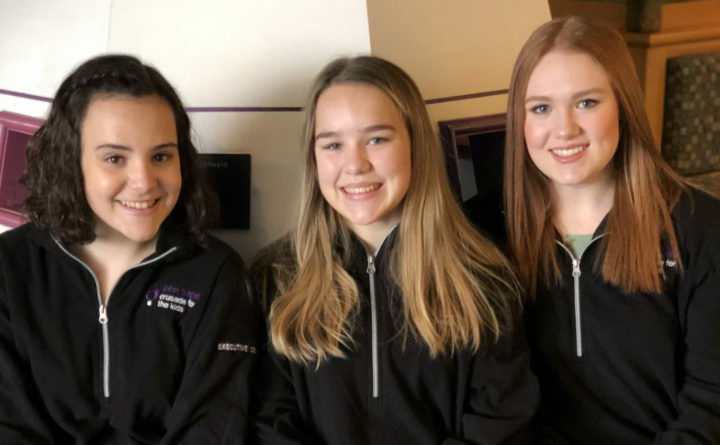 John Bapst juniors (from left) Rachael Kiah, Audrey Seymour, Lauren Holyoke, and Hunter Pelkey (not pictured) are the founders of "Crusade for the Kids," Maine's first high school Miracle Network dance to benefit pediatric healthcare. BANGOR — Friendly competition among students will support healthcare for local kids at Maine’s first high school Miracle Network Dance Marathon. Crusade for the Kids will be held at John Bapst Memorial High School from 8-11 p.m. Friday, Feb. 8 at 100 Broadway. All proceeds will benefit pediatric care at Northern Light Eastern Maine Medical Center, our local Children’s Miracle Network Hospital. Dance Marathon is a movement led by university and high school students at more than 450 schools across the country, all raising money for their local children’s hospital or program. Since 1991, dance marathons have raised more than $250 million for the 170 hospitals and programs. Crusade for the Kids is the first high school event in Maine and joins the University of Maine’s Black BearTHON to raise money for pediatric care in central, eastern, and northern Maine. UMaine’s event inspired Crusade for the Kids co-founder Audrey Seymour to bring the fundraiser to her school. For the past six years, Seymour, a John Bapst junior has represented EMMC with students at Black BearTHON. In addition to dancing, the event will feature games, prizes and a photo booth. Several local families who have benefited from the care at EMMC will join the celebration and share their stories of hope. For more information, contact Northern Light Health Foundation at 207.973.5055 or kpearson@northernlight.org.